On Tuesday luxury home builder Toll Brothers announced that demand for its houses was strong across the country and that the company signed a record number of contracts last quarter. Likewise, homebuilder Lennar and home improvement companies Home Depot and Lowe’s are also reporting strong results, with analysts expecting a nearly 30% jump in Lowe’s earnings. Unemployment keeps falling, the stock market hit a record high and home prices keep going up. It's a great recipe for a strong housing market, and a strong economy, so good that even failing anti-Trump media outlet CNN had to report on it, naturally without giving any credit to President Trump. But there’s rain falling on all this good economic news: The Federal Reserve is raising interest rates… again. After keep rates at zero for most of the Obama presidency the Fed has raised rates five times since Trump took office, twice since President Trump’s nominee Jerome Powell became head of the central bank. And the President isn’t happy about it. Trump told Reuters that he was "not thrilled" with Fed Chair Jerome Powell for raising rates. Asked whether the Fed should be more accommodating, he said, "I should be given some help by the Fed." The president said he would criticize the Fed if it continues to raise rates. President Donald Trump said the Fed should do "what's good for the country," according to the interview with Reuters. Trump, who criticized the Fed when he was a candidate, said other countries benefited from their central banks’ moves during tough trade talks, but the United States was not getting support from the Fed. “We’re negotiating very powerfully and strongly with other nations. We’re going to win. But during this period of time I should be given some help by the Fed. The other countries are accommodated,” Trump said. While Reuters chastised the President for criticizing the Federal Reserve, claiming “American presidents have rarely criticized the Fed in recent decades because its independence has been seen as important for economic stability” the truth is that presidents have never been bashful about “jawboning” the Fed. Earlier this year Maria Bartiromo of Fox Business asked Treasury Secretary Steve Mnuchin about inflation and signs that wages were rising. “We want wages to go up. A little bit of inflation is a good thing. Too much isn’t a good thing but I see only a little bit,” Mnuchin said. Mnuchin added that he sees no signs of too much inflation in the future, reported Breitbart’s John Carney. 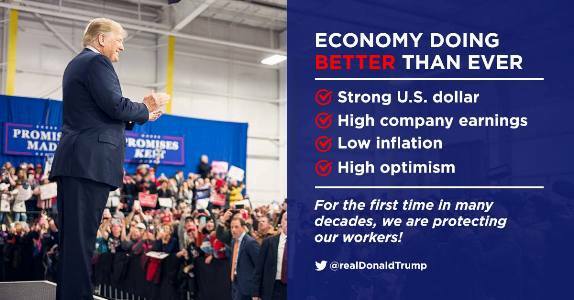 A year and a half into the Trump presidency the American economy has seen solid growth, more people in jobs and Wall Street has broken records on a regular basis. However, in the alternative universe where Wall Street’s Masters of the Universe and the mandarins who control America’s Federal Reserve Bank live, good news for America’s middle-income families is apparently bad news. President Trump campaigned on policies that would boost the economy to 4 percent – or greater – growth. Now, just when America’s hard-pressed middle-income families are beginning to see the benefits of Trump’s policies, is not the time for the Fed to cool the economy.